HT Parental Controls provides parents with an easy way to set up your rules for all computer activities and protect children from all harmful and inappropriate content. It lets your children navigate online safely. You can see what they view or play, block access to websites and apps or limit certain websites in a friendly way. HT Parental Controls helps concerned parents shield children and prevent them from accessing inappropriate websites. The program contains many superior features that make the software great for parents. Our real-time internet filter automatically blocks all harmful and inappropriate content to protect your children. Complete the simple installation and start controlling your family’s online activity. In today’s world, internet and smart devices have become a necessity. Smart devices are used everywhere, even by kids in schools to do homework, research, assignments, and more. Kids spend more time online than anyone else, even more than their parents. But this bring us to another problem, there are explicit, disturbing, and illegal sites on the internet that are not suitable, and are harmful for children. Moreover, kids can end up wasting a lot of their time browsing websites or chatting with their friends. That’s why parental control applications came into existence. There are many applications available in this category, but not all of them work the same. HT Parental Controls is a simple and intuitive software utility designed for parents, to help them restrict their child’s activity on PC. The application comes packed with many tool, that can help parents monitor their kids’ computer actions and control their Internet access. The installer size is ~10MB and the installation process is simple and straightforward, taking no time at all to complete. After the installation process completes, it asks you to enter the license key to activate the application. Once you enter the license key, and activate the application, you can start using the application and take advantage of the tools that it comes packed with. The user interface of the application is simple and straightforward, with well-organized and colorful icons for different tools and features. At the top, is the menu bar with the usual drop down menus. The features and options are divided in to three categories: Reports, Controls, and Settings. The first category contains reports on recorded applications, websites, search queries, computer activity, and screenshots. ‘Controls’ category contains, Website limiting, Website blocking, Application blocking, Windows security, and Time controls. ‘Settings’ category contains General settings, User accounts, Monitoring settings, Email reporting, and Remote manager. At the bottom it shows status of the application, there is a Start/Stop and Help button at the bottom. – The UI of the application is clean and simple, designed to be suitable for all types of users, even the novices. – Records all traffic provides you with detailed reports of each visited website. – It shows you detailed reports and keeps log of activity of used applications, visited websites, search queries, screenshots, and computer activity. – Block IMs, games and any unwanted software that can be a time waste or harmful for your child. – Restrict access to important Windows functions like Control Panel, Task Manager, Registry editor, CMD, and more. – Set up time control, and schedule PC usage timings and choose an operation to perform when the time limit completes. – It allows you to set different control levels for certain users. You can enable monitoring, website and application filters, time controls, and windows security permissions on an individual basis to tailor restrictions. – You can get email reports with logs as frequently as every hour. It is not necessary to have physical access to the monitored computers. – Running in stealth mode HT Parental Controls silently works without being detected. – No applications for other smart devices like iOS and android. Other developers have applications to control and monitor activity on these devices too. 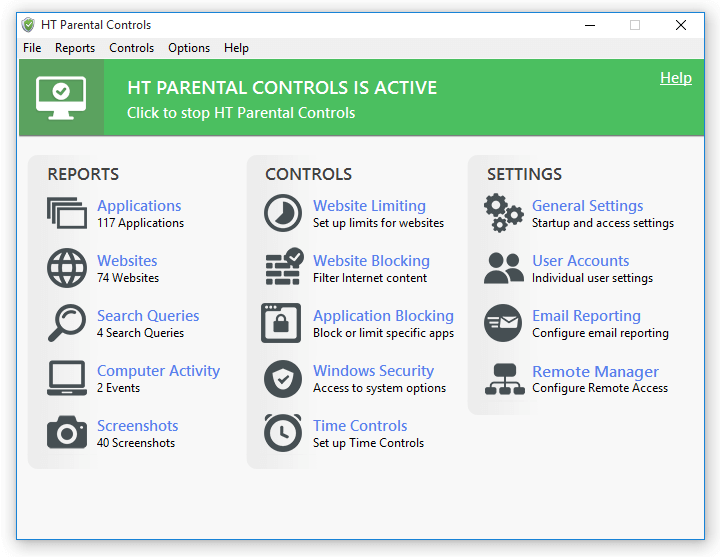 HT Parental Controls is a lightweight yet powerful application, that comes packed with plethora of tools, that can be helpful and useful for parents. These tools can help you monitor, record, control, and restrict your child’s activity on a PC. The application runs smoothly, without any lag or crashes. It is definitely worth trying.